An offline Outlook data file is created if we are using an Microsoft Exchange account and cache Exchange mode is enabled. An offline .ost data file is the synchronized copy of the Exchange Server’s mailbox data stored on your computer. This article explains how to move an offline outlook data file (.ost) to another computer. 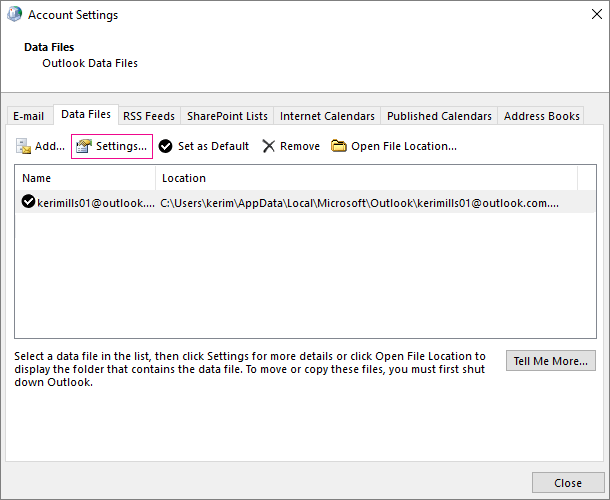 Open Outlook > File tab > Account Settings > Account Settings > Data Files. Data file tab will show the location of your OST file. Note: In the below section, I will describe required steps to move offline Outlook Data File (.ost) but if you are thinking to move an offline outlook data file (.ost) to another computer, you don’t need to go through these steps. As when we add Exchange account in Outlook on another computer and then work offline, an offline Outlook Data File (.ost) is created automatically and your Outlook data file is downloaded. Go through Account Settings and choose the Data Files tab. Select your Exchange account, and choose Settings. On the Advanced tab, clear the Use Cached Exchange Mode check box, and select OK.
At next step, choose Settings. On the Advanced tab, opt for Outlook Data File Settings > Disable Offline Use > Yes. 1.I want to create a file: In this option, you will choose a location to save the offline ost file. 2.I want to move the old file:Browse and select the offline Outlook data file hat you moved to a new folder location and choose open and OK. In Advanced tab, select the Use Cached Exchange Mode check box and ok after that prompt to restart Outlook. Finally close the Account Settings and the Mail Setup dialog boxes. Note: You will notice one thing is that after creation of new OST file or moving offline outlook data file, an old OST file is not deleted. You can delete it as per your choice.